FROM ST. PETERSBURG TO STOCKHOLM. STOCKHOLM, June 15.--The "Northern Venice" is no inapt title for Stockholm, for, like its namesake, it is one of the few places which no description can spoil. The irrepressible guide-book may indeed give us the circumference of the city in miles, the height of the churches in feet and inches, the width of the bridges and depth of the harbor, and may artfully inform us that "the front of the palace is considered a model piece of architecture," or that "the iron tower of the cathedral is universally admired," thus giving us a timely hint at what point to get up a little appropriated enthusiasm. The scribbling tourist, who is laboring to squeeze out materials for Rambles in the Northern Cities, or The Knapsack in the Land of Odin, may rhapsodize about "leaf-crowned shores," and "girdling waters," and "the wild luxuriance of untamed nature," and all the rest of it; but both descriptions leave the reader just as wise as he was before on the question of what Stockholm is really like. Perhaps the Swedish capital may be best defined by calling it "Venice Built on the Hudson." To all the architectural beauty of Copenhagen or St. Petersburg it adds the imposing elevation which is so signally wanting in both. With its terraced streets rising mass above mass over the blue rippling sea, its curving hills wooded to the water's edge, its forest masts bristling against the sunny sky, its noble palace standing out conspicuous on the bold ridge above the Maelar, the great city has a royal and commanding beauty of its own which few of the world's capitals can rival. Claude Lorraine himself could have desired no finer study than the view of Stockholm at sunset when the red glow falls upon green islets and broad white bridges, upon spacious quays and steep, winding streets, upon shady gardens and great waves of leafy hillside, crested with stately houses and shining church towers, and upon the broad, smooth brightness of the Naelar lying in the midst of all, "a sea of glass mingled with fire." There are few tastes, indeed, whether artistic or practical, which Stockholm cannot gratify. Are you antiquary? The Royal Museum, famous throughout Northern Europe, offers you all its treasures. Are you a boating man? Here is a sheet of smooth water that might satisfy Hanlan himself, and a choice of excellent boats at any hour of the 24. Are you an admirer of architecture? You may gaze your fill upon the delicate tracery of the wrought-iron church tower and the grand simplicity of the palace, which forms a noble medium between the gingerbread ornamentation of the Winter Palace at St. Petersburg and the ostentatious lonliness the royal residence at Copenhagen--the Russian ediface being, in fact, a servant disguised as a King; the Danish, a King disguised as a servant, and the Swedish, a King dressed as a man. Are you a pedestrian? The breakneck streets of the upper town will find you in ample exercise, and the surrounding country provide you with an endless selection of routes. Are you a lover of the picturesque? The whole panorama of the town lies before you, and when you have exhausted it, or think you have, you may still enjoy a fresh view from the little knuckle of rock, crowned by a tiny pink six-gun fort of the best toy-shop architecture which calls itself a "citadel," or wander through the secluded "Djur-Garten," (deer-garden,) with its white-balconied villas overlooking velvet lawns, its shady nooks furnished with comfortable seats, and its shadowy vistas enshrining noble statues. Nor is the seaward panorama in approaching Stockholm from the east in any way unworthy of it. Nothing, except, perhaps, the Thousand Islands of the St. Lawrence, can match that magnificent procession of rocky islets crested with dark foliage, every leaf of which is mirrored in the glassy water below. So thick are the islands at the entrance of the Gulf of Bothnia that, all the way from the Finnish coast to that of Sweden, we never once lose sight of land, which is at times so close on either side that we seem to be sailing through a canal. At every turn the way seems completely blocked; but just as you are wondering how the steamer is to get out she suddenly shoots through some narrow channel into the midst of fresh archipelagoes, each with its own cluster of tiny red huts and its own toy flotilla of fishing boats. Here and there peeps out a dainty little white villa, with a patch of smooth lawn that looks deliciously fresh and green against the sombre background of the pine forest, suggesting tantalizing thoughts of a month's holiday in the woods, an early swim every morning in the clear, cool water, an unlimited cruise from island to island in one's own boat, midnight fishing excursions, yarns by the camp-fire, and all the delights of that glorious gypsy existence which the happy residents of these parts enjoy to the full every Summer. In the meerschaum, in the novel, in the roll of billiard balls. Nothing with me but a sandwich, nothing on me but a shirt. Not with reeling senses poring over Bradshaw's books. The voyage from St. Petersburg to Stockholm, though shortened somewhat from its original length of four days, is still quite methodical enough to recall forcibly Mr. Kinglake's famous saying that before he had voyaged across the Levant in a Greek vessel he had thought that Ulysses need hardly have taken 20 years to sail from Troy to Ithaca, but he now considered it a very fair average passage. But, with all their slowness, there is something wonderfully attractive about these plodding old boats, which seem just the right kind of conveyance for entering patriarchal Sweden, the land where no one is ever in a hurry, ever gets tired, or ever wants to go to bed. No one can be ill on board, for the water is far too smooth to give even the shadow of an excuse for it. No one can quarrel, there being no common language in which to do it. No one need be hungry, for the three substantial meals daily are further improved by a kind of prologue, consisting of innumerable saucers filled with salt beef, tongue, ham, smoked salmon, sardines, liver-sauce, and spiced bread, which our Finnish and Swedish fellow-passengers mis in a way sufficient to shatter the digestion of the stoutest rhinoceros on the Congo. Moreover, the coming of our steamer is the event of the week in many of the coast towns, and received as such with unbounded enthusiasm. As we thread our way among the islands, every person on shore seems to think it a point of honor to wave their pocket-handkerchief as frantically as if signaling a street car, in proof of the interest which he or she takes in our movements. A DELIGHTFUL PANORAMA OF SWEDISH SCENERY. THE OLD SVENSKE BLOOD--AN OVERCROWDED STEAMER. TROLLHATTEN, West Sweden, June 17.--A secluded valley, shut in by rocky hills, covered to their very summit with those sombre pine forests whose ghostly shadows Moritz Retzsch would have peopled with the revels of witches and demons; a quiet little Swedish village, flanked on one side by a smooth, sluggish canal, on the other by a raging waterfall, which, split in three by huge masses of wood-crowned cliff, goes rushing and roaring down the gorge in an endless succession of foaming breakers; a collection of hideous saw-mills around the finest spot, and a wooden pay-gate commanding the only bridge that leads to the fall, showing that the Swedes have not studied Niagara in vain--such is our last glimpse of Sweden before crossing the Norwegian frontier to-morrow, where I hope to be more fortunate than in Iceland, although in some points the two countries are formidably alike. But, whatever mischances may await me beyond the Norwegian border, my last two days in Sweden have been an ample compensation in advance. To the irrepressible excursionist who does Europe against time, and whose first inquiry on reaching a new city is about the next train for somewhere else, the slow passage of the Gotha Canal and the great lakes would doubtless be unbearable; but there are few journeys in all Europe more thoroughly delightful in every way. It is true that the sun and wind make sad havoc of one's complexion, and that it is somewhat startling to awake and find your face one glow of burning splendor, suggestive of a long and steady course of outrageous drunkenness, or to see your nose covered with fluttering pennons of loose skin, like a ship with all her flags hoisted. But this is "all in a day's work," and not to be grumbled at. As for the scenery, the marvelous beauty might have inspired the enthusiastic Alderman who said that "wonders had never done ceasing." The northern forests, so gloomy and lifeless in winter, are in their glory now, and the sea of fresh foliage that extends in every direction is a perfect treat after the bare, dusty plains of Central Russia, while the broad lakes, framed in slopes of velvety green sward, the rugged rocks starting up through the smooth turf, the little red log hovels and white-balconied country houses, the quaint old church towers, half seen amid clustering trees, form one of the most charming pictures imaginable. At one moment we look out over a boundless expanse of rich corn-land, dotted with painted huts. The next, we are gliding between two huge overhanging rocks, which frown upon us like Bunyan's twin giants scowling at the escape of some daring pilgrim from the Valley of the Shadow of Death. Then we dip suddenly into a shady dell, in the hollow of which a cluster of giant trees bend over a babbling brook, like a group of veterans listening to the prattle of a child. Anon we are looking down upon a low stretch of meadow on either side, many feet below the level of the canal, so that we actually seem to be sailing above the land upon a ridge of water. And now we burst all at once into a wide, glassy lake, over which the setting sun--if he can be said to set at all in this wonderful region--pours a flood of golden glory as far as the eye can reach. But the villages. What description, now that Washington Irving is gone, can do justice to them? There is a curious mixture of primitive dignity and Sleepy Hollow repose about some of these little one-storied cots, which nestle round the white, low-towered church like chickens around the mother-hen. This high-fronted tenement of black and white beams is adorned with some half-effaced gilt letters, which announce that it unites the dignities of bank and Post Office. That puckered little building with teh hock-nosed roof proclaims itself, on the strength of three old books and a fly-specked newspaper in its one window, as a "Bibliotek," (library). Before two or three of the doors further up the street stand groups of big, fresh-looking men, in steeple-crowned hats and blue stockings, smoking their pipes and chatting just as their forefathers may have done while a reign of terror was darkening beautiful Stockholm, and when the last of the blood-royal was skulking in the mines of Dalecarlia. Very quiet and unpretending are these little nooks, which Time himself seems to have forgotten; yet it was just such spots as these which sent forth men who stormed Wallenstein's batteries at Lutzen, and turned to flight the armies of Russia, 8,000 to 80,000, on that bleak Winter morning, before Narva, two centuries ago. And one glance at the hardy, resolute faces of these stalwart villagers suffices to show that, although the day of Sweden's supremacy is indeed gone for ever, the good old Svenske blood has not yet grown cold. As to the deck panorama of the canal steamer itself, Dickens alone could worthily describe it. The same fortune which threw me among a chain-gang in Central Asia, and a group of handcuffed murderers on the Caspian, in 1873, seems to haunt me still. I came up the Baltic last month with a company of factory hands en route for Central Russia; I traveled through Central Russia the other day with a gang of convicts on their way to Siberia; and I have just crossed Sweden with a caravan of Finnish emigrants bound for New-York. My first impression of these amiable exiles fully bore out all that I said in my last letter respecting their innate fierceness and intractability. Before I had been 10 minutes on board I saw one of them knock another head foremost down the forehatchway, with a straightforeward blow between the eyes which Senator Morrissey himself might well have applauded. A little later, I came upon a third who was manfully doing his best to break the back of a comrade against the corner of his iron-bound chest. Turning from this pleasing spectacle, I caught the sight of a fifth member of the same church, seemingly bent upon cutting a slice out of the Captain with his sheath-knife, thinking, perhaps, that a joint of fresh-killed Swede would make a seasonable "relish" for his black rye-loaf. DST from late Mar to late Oct. The Kingdom of Sweden occupies the eastern side of the scandanavian peninsula, bordered by Norway and Finland, and separated from Denmark in the Baltic Sea only by a narrow strait. The capital is Stockholm. 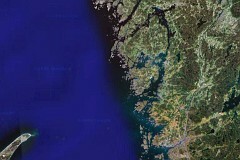 The area of Sweden is 173,732 square miles (449,964 square km). The estimated population of Sweden for July, 2007 is 9,031,088. The official language is Swedish. Swedish Embassy in Washington, D.C.
As for the crowding, no words can convey any impression of it. Reserved first class deck and reserved second, forecastle and 'tween-decks, even the saloon passage and the space around the bar, were all alike, one welter of bags, boxes, casks, bundles, feet, hands, faces, crying children, screaming women, yelling men, exactly like a wrecked railway-train. Despite all this, however, the picturesqueness of the voyage, its splendid weather, its ever-varying scenery, its utter unlikeness to anything that one sees elsewhere, make it wonderfully attractive. At every turn you find yourself jumping ashore while the steamer is passing a lock, walking a mile or two along the bank, visiting some interesting church or factory, and jumping aboard again, till you hardly know whether you are traveling by land or water. The other day I and two other passengers, (one a lady,) having gone too far beyond the last lock in the hope of finding another, had to scramble on board at hap-hazard as the steamer ran past us, by a rope which some humane sailor threw us from the upper deck! I must break off, to begin my preparations for crossing the border, which is, unhappily, not quite such a simple affair with us as with the French envoy, who, when ordered by some diminutive German potentate to "quit his dominions within 24 hours," answered coolly, "If your Majesty will take the trouble to look out of the palace window, you will see me crossing your frontier in less than five minutes." I have just learned, on the best possible authority, that the long-desired concession for a complete canal system between the White Sea and the Gulf of Finland, uniting St. Petersburg and Archangelsk by means of Lakes Ladoga and Onega and the intermediate rivers, is about to be granted at last. The world's oldest industrial corporation is still going strong. Where? In Sweden. In operation 73 years after King John signed the Magna Carta and more than 200 years before Columbus discovered America, Sweden's Stora Kopparberg Bergslags Aktiebolag has fueled Sweden's industrial growth over the centuries, and today is a modern diversified giant whose eye is on the future. Stora Kopparberg is Sweden's largest producer of electricity, one of the biggest manufacturers of pulpwood and newsprint (with exports to 40 nations), the largest supplier of dairy and agricultural produce, the biggest steelmaker and a major producer of agricultural chemicals. As if that were not enough, Stora Kopparberg also manufactures the red paint that covers cottages throughout the picturesque Swedish countryside. Hell & Glory. Like its name, the company's history is linked to Stora Kopparberg-- a great subterranean copper "mountain" of unusually pure copper ore located among the gloomy forests of central Sweden. Toward the end of the Dark Ages, when copper was needed to arm Europe's growing armies, hundreds of men migrated to the copper mountain. At the pithead sprang up the village of Falun, Sweden's first industrial center, where the company still has its headquarters. At first each miner dug and smelted the ore himself, but by 1347 King Magnus Eriksson had granted a charter setting up a corporation of master miners. The largest copper supplier in medieval Europe, Kopparberg made Sweden a major political power; its profits financed King Gustavus Adolphus' part in the Thirty Years War (1618-48), which established Swedish hegemony over Europe for nearly a century. When Queen Christina visited the mine in 1646, she said: "The greatness of the realm stands and falls with the copper mountain." For all the glory that the Kopparberg brought Sweden, mining conditions were appalling. Sulphurous smoke blacked the huts of Falun and killed off all plant life for miles around. The worker's plight in the dark and sooty mines was so bad that a visitor in the 1700s wrote that "no theologian has ever been able to describe hell so frightfully." In the early 19th century, as iron began replacing copper in importance, Stora Kopparberg turned away from the riches of the copper mountain and began the diversification that has kept it alive and thriving. Lean at the Top. Under Managing Director Hakan Abenius, 60, a grave and quiet Swede who took over in 1948, the company is steadily branching out, has three plants abroad, and is now part of a consortium developing molybdenum deposits in Greenland. Last year Stora's sales were about $153 million, are expected to rise slightly this year. Despite its advanced age, Stora has avoided hardening of the arteries by keeping its upper echelon lean (only 16% of its staff are salaried white-collar workers v. 25% for the average Swedish firm) and its plants are remarkably efficient. Stora has built so many specialized machines and invented so many processes that it derives a substantial income from 120 licensing agreements with foreign countries. Its most notable recent achievement was the development of the Kaldo steelmaking process, which rivals Austria's famous LD process for making high-grade steel more quickly and efficiently. No one knows exactly how old Stora is. The first documented reference to it dates from 1288, but archaeologists think that mining was going on long before that. Teams of Stora experts are employing spectroanalysis to determine the age of ancient copper objects that have been found in the old mine shafts. They may go back 1,000 years.